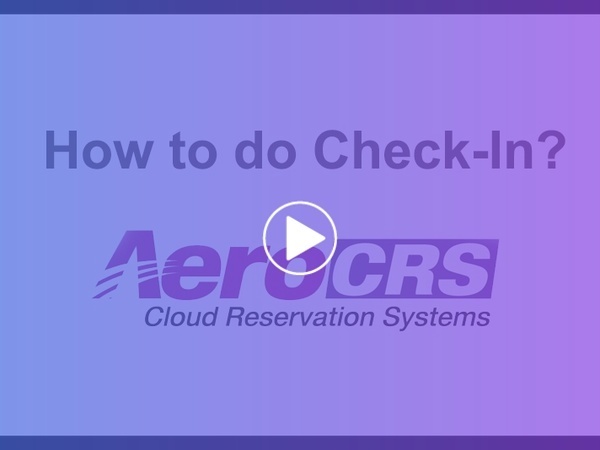 In this article you will learn how to do check-in with AeroCRS system. Please note that the Check-in feature is additional feature to the system, and not available in all packages. From the list of flights (If more than 1), select the flight which need to do the check-in. In the check-in screen, you start the process of the check-in. The top segment of the check in screen show allow you to filter the information shown below. Search: You can search by PNRs in the flight for check-in. All destinations / AC: You can filter results by specific routes of the flight. Any status: You can filter by passenger check-in status. Close FLT: Close the flight from making changes and amendments. Save icon: Save the changes made in the check-in. Gear icon: Open the flight screen. Refresh icon: refresh the check-in screen's results. The information area shows all the information and check-in status of the passengers in the specific flight. PNR column: Open view mode of the PNR. INF: Select and tick the check box in the passenger is carrying an infant. FF: Click and type the customer's frequent flyer information. NOP: Type the number of pieces of baggage the passenger has. KG: How much Kilograms of weight the passenger has. : Click to save the changes made for this passenger. Service notification: Additional notifications which were included in the flight screen, shows in the check-in module and manifest as well. Crew: Crew members which has been allocated to this flight, shows in the crew column. Routing: Routing which has been written in the flight screen shows in the check-in module and manifest as well. Total: Sum up the total of each status for the flight and the total according to gender. In order to complete the check-in process on the system, click the Complete DCS check box on the top area of the check-in. When you you process a passenger through the check-in module, the system will also implement a color indication in the Travellers section within the PNR. Once a passenger has been set with a check-in status in the system or the system detected that the passenger's flight has been opened for check-in, the passenger name in the PNR will be automatically highlighted with the relevant color based on each status.